When you’re looking for a meal replacement shake for weight loss, it can seem like the options are infinite. There are so many different brands, flavors, and types – how can you choose? It can be a bit overwhelming when they all claim to be the best, which is why we have provided this review of two popular shakes – Almased and Yokebe. Almased is a meal replacement shake that comes in one flavor (plain). It is recommended by the manufacturer for weight loss and weight management as well as general wellness. Almased was created to increase the metabolism of overweight people, allowing for healthy yet effective weight loss. These shakes can be purchased at a variety of stores such as Walgreens, GNC, and of course Amazon, with an average price of $27.99 for a 17.6 oz container (10 servings). Nutritional adequacy, providing the body with vitamins and minerals that your regular diet might not, allowing you to stay healthy and well-nourished during weight loss. Almased is produced and sold by a family business started in Germany, and the Trouillé family values of quality and health are still embodied by the product today. Almased has expanded to become available in Canada, parts of the UK, Switzerland, Austria, and the United States. Yokebe Active Food is a weight loss shake meant to replace 2 meals per day in order to promote a reduced-calorie diet. At the present time, it appears to only be available in Ireland after being discontinued in the UK. Three flavors are available – original, chocolate, and strawberry. Yokebe can be purchased online for £19.99 per 400-gram container (10 servings), or customers can select a £22.99 package that includes an attractive shaker bottle. Both shakes have a relatively high amount of sugar – with Almased ringing in at 15 grams per serving, and Yokebe ranging from 16.8 grams (classic flavor) to 21.3 grams per serving in the strawberry flavor. However, both shakes source their sugar from honey, allowing for a lower glycemic index and providing benefits such as natural enzymes and a naturally sweet taste. A portion of the sugar in Almased also comes from yogurt, resulting from a special fermentation process. Neither shake contains any added sugars, which is ideal for a healthy lifestyle. Winner: Almased, due to its slightly lower sugar content and variety from honey and yogurt. Even though they share the same overall goal of weight loss, each shake has slightly different protein sources and contents. Almased contains 27 grams of protein per serving from soy protein isolate, skim milk, and yogurt powder. Honey also provides a fair amount of branched-chain amino acids (BCAAs). 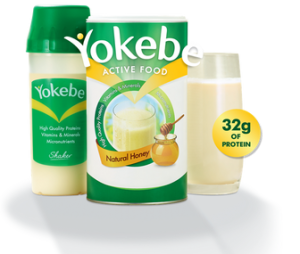 Yokebe includes both soy protein isolate and whey protein concentrate, as well as BCAAs from honey. The classic flavor provides 16.8 grams of protein per serving, while chocolate has 21.2 grams and strawberry 21.3 grams per serving. As both shakes contain both soy and whey protein and Almased contains milk and yogurt, neither is dairy or soy-free. Winner: Almased, as its protein content is significantly higher per serving, and milk and yogurt are higher-quality sources of protein compared to whey protein concentrate. Almased is non-GMO, gluten-free, diabetic-friendly, gluten-free, and vegetarian, making it ideal for the nutritional requirements of just about everyone. It is also free of added sugars, preservatives, artificial flavors, and filler ingredients. Unlike many weight loss products, Almased is also stimulant-free, allowing for weight loss without the unnecessary side effects of caffeine and similar products. Ingredients found in Almased include soy protein isolate, honey, skim milk, yogurt powder, potassium chloride, magnesium carbonate, calcium citrate, vitamin C, niacin, riboflavin, vitamin E, zinc oxide, ferrous fumarate, manganese sulfate, calcium pantothenate, vitamin B2, vitamin B6, vitamin B1, vitamin A, folic acid, potassium iodide, sodium selenite, biotin, vitamin D3, and vitamin B12. Yokebe prides itself on providing a product that contains only naturally-sourced ingredients. Like Almased, it does not contain any artificial flavors, preservatives, or sweeteners. Ingredients found in Yokebe include soy protein isolate, whey protein concentrate, maltodextrin, honey, vanilla flavoring, calcium phosphate, potassium phosphate, silicon dioxide (anti-caking agent), L-ascorbic acid, vegetable oil (palm oil), beta-carotene, ferric phosphate, nicotinamide, DL-alpha-tocopherol, zinc gluconate, calcium-D-pantothenate, manganese gluconate, cupric gluconate, pyridoxine hydrochloride, thiamin mononitrate, riboflavin, retinyl acetate, pteroylmonoglutamic acid, potassium iodide, sodium selenite, D-biotin, cholecalciferol, and cyanocobalamin. Yokebe also notes on its packaging that it may contain traces of egg in addition to soy and whey ingredients. Winner: Almased. While both products’ ingredient lists read a bit like a chemistry textbook with a multitude of added vitamins and minerals, Almased seems to have more “real food” in their shakes such as using yogurt as a sweetener compared to Yokebe’s use of maltodextrin. How do I know how much powder to put in my shake? If you are less than 5’6” tall, you should use 6 tbsp of Almased. If you are 5’6” to 6’0” tall, use 8 tbsp. If you are taller than 6’0”, use 10 tbsp of Almased in your shakes. How do I prepare my shake? In a shaker bottle or blender, combine the appropriate amount of Almased powder (based on your height), 10 to 12 oz of liquid (such as bottled or filtered water, skim milk, or unsweetened almond or soymilk), and 1 to 2 tsp of oil. You can also add 1 tsp of spices or flavoring extracts to add flavor – some favorites include cinnamon and unsweetened cocoa powder. How does the Almased diet burn fat without also burning muscle? Since you are using Almased shakes as a meal replacement, you are consuming fewer calories than you would normally, which prompts your body to burn fat reserves for energy. Since Almased contains high-quality protein, your muscle mass is spared from being broken down for amino acids. Have the weight loss claims been researched? Yes. Clinical studies in both the United States and Germany have supported the use of Almased for weight loss, and these studies can be found in reputable academic journals. Is Almased appropriate for lactose-intolerant people? Most people who are lactose-intolerant can consume Almased shakes without any adverse effects due to its special fermentation process and minimal amount of lactose. However, it may cause side effects in people who are extremely sensitive to lactose. Is Almased safe for people with food allergies? Almased includes soy, milk, yogurt, and honey – if you are allergic to any of these foods, Almased is likely not appropriate for you. Why do I need to add oil to my shake – isn’t fat bad for you? Fat is necessary in your diet for a variety of reasons, and essential fatty acids (EFAs) are even more important. EFAs such as omega-3 and omega-6 fatty acids are especially important when you are on a diet, as they can help decrease inflammation and lower high cholesterol and triglycerides. Approximately 5 to 7 tsp of healthy fats are recommended each day, including whatever amount you use in your shakes. What type of oil should I add to my shake? Oils with higher concentrations of EFAs are best, such as olive, flaxseed, and walnut oils. Can I mix Almased into hot coffee or tea? This is not recommended, as extreme temperatures (both hot and cold) can degrade proteins and affect the way they are digested and absorbed. High temperatures can also destroy the useful enzymes found in Almased. Can I mix Almased into juice? Yes, if you prefer to. It is best to dilute juice with water (3 parts water to 1 part juice) in order to decrease the sugar and caloric content. Always remember that fruit juice does contain sugar and will add calories to your diet if you choose to mix Almased into it. Can Almased be prepared ahead of time and consumed later? If you absolutely need to do so, it may be. However, the active enzymes in Almased are most useful when consumed immediately, so you should prepare your shake right before consuming it if possible. Is Almased appropriate for people with thyroid disorders? It is best if you check with your doctor prior to starting Almased. If you are taking thyroid hormones, there is a potential theoretical interaction between soy products and thyroid hormone absorption. However, if you take your medication as prescribed, there should not be any side effects. What will I eat and drink when I finish losing weight with Almased? Once you reach weight maintenance, you can eat a sensible, balanced diet and continue to exercise regularly. If you would like to continue to use Almased as an occasional meal replacement, you can certainly do so. This can especially be helpful for the other meals in a day when you are going to have a large meal. You can also use Almased in your favorite smoothie recipe for a healthy yet craving-crushing snack. How do I prepare my Yokebe Classic shake? Add 200 mL low-fat milk, 50 g Yokebe powder, and ½ tsp vegetable oil to a shaker bottle and shake for about 10 seconds. How do I prepare strawberry or chocolate Yokebe shakes? In a shaker, combine 250 mL low-fat milk and 50 g Yokebe powder, and shake for 10 seconds. Yes. All flavors are gluten-free. Is Yokebe vegetarian or vegan? Yokebe is vegetarian, but it does contain vitamin D derived from lanolin, so it is not vegan. Although no specific clinical trials have been completed using Yokebe, meal replacements in general have been proven to be successful in weight loss and maintenance. Is Yokebe appropriate for lactose intolerance? If prepared with lactose-free milk or water, Yokebe is lactose-free. However, if you prepare it with water, it will not meet the calorie requirements of a meal replacement. Does Yokebe interact with medications? No, it should not interact with any medications. However, check with your doctor prior to starting the Yokebe diet if you are taking any prescription medications. Yokebe is specifically designed for the nutritional needs of adults. It may be suitable for some older children who wish to manage their weight, but you should always check with a pediatrician prior to starting to determine if it is appropriate for your child. Yes, it can be consumed by diabetics. However, you should only do so under the supervision of a doctor. Yokebe does contain sugar and protein, so you may need to have your blood sugar and electrolyte levels and kidney function monitored while using Yokebe. Do I need to exercise while on the Yokebe diet? Exercise is recommended for overall improved health and wellness. Although weight loss can be achieved without exercise on Yokebe, 30 minutes of moderate exercise (such as a brisk walk) on most days of the week may be helpful in achieving your desired results more quickly. Why do I need to add oil to the Classic flavor shake? Unlike the formulation for the chocolate and strawberry flavors, the classic shake requires added oil in order to help you absorb fat-soluble vitamins better. After you have prepared your shake, it will not taste oily or slimy at all. What type of oil is best to add to my shake? Oil with high levels of unsaturated fatty acids are best – such as sunflower, safflower, or grapeseed oils. Can I make my Yokebe shake ahead of time and drink it later? Yes, if you prefer to do so. However, it tastes best when freshly made. If you need to prepare it ahead of time, keep it chilled until you are ready to drink it, and shake prior to serving. Can I heat my shake? It is best if you do not, as you risk destroying the vitamins in the Yokebe shake. For best results, Yokebe should be served cold or at room temperature. Blood sugar control is improved by the low-glycemic shake, allowing for reduced responses from insulin and glucose, even after the next meal. By improving glycemic control, weight loss typically becomes easier. Almased helps to regulate the appetite by decreasing levels of ghrelin and increasing levels of Peptide Tyrosine Tyrosine (PYY), a combination that leads to improved satiety and the feeling of staying full for longer, allowing for easier weight loss. Due to special processing methods, essential amino acids are preserved, which maintains a high-quality source of protein. The product has been clinically studied in two different countries, which certainly helps to back up its claims. Having the option of three different flavors is useful, as not everyone may like the taste of the classic version. This can also be helpful when consuming several shakes in one day, as variety can keep the Yokebe diet interesting. Only one flavor (essentially an unflavored version) is available, and this may be off-putting to people who do not like bland foods. However, Almased does provide a few suggestions for spices and flavorings to add to make the shake more interesting. 15 grams of sugar from Honey and Yogurt. Like Yokebe, the sugar is from natural sources but is still on the higher end of the scale. Adding 1 to 2 tablespoons of oil to help vitamin absorbtion may be a bit of a chore. The nutrition label notes that Yokebe may include trace amounts of egg. However, there are no ingredients containing egg or related foods, so this raises a question about the manufacturing processes and whether Yokebe is processed on machines used for other products. Yokebe contains 16.8 grams of sugar. Although this is from natural honey it is still a high amount. As Yokebe is currently only available for purchase in Ireland, it is likely difficult for people who do not live there to buy. It also begs the question of why it was discontinued by the manufacturer in the UK. It does not appear that any clinical research has been done using Yokebe, so the merits of the shakes have not yet been officially proven. Personally, if I saw both Almased and Yokebe shakes on a store shelf, I would consider buying both. The pricing is reasonable compared to other meal-replacement shakes on the market, and the idea of drinking an easy-to-prepare shake that would keep me full for hours certainly appeals to me. I have never tried a shake that requires added oil to provide optimal vitamin absorption, so I would be interested in seeing if the flavor was enjoyable and the consistency relatively appealing. I would not consume Yokebe or Almased on a daily basis but more as a snack or one of meal. This is because the sugar content is too high for me. Luckily the Honey and yogurt are natural forms of sugar but I still do not want to be drinking over 15g of sugar in one drink every day. I don’t believe this is healthy. That’s why I would take Yokebe or Almased as a quick snack or meal replacement if I absolutely had to. I would not incorporate into my daily diet or routine. As it is available in stores and online in several countries, purchasing Almased here in the United States would be easy for me. I’m not sure how I would go about buying Yokebe, as it seems to only be available at some shops in Ireland. I like the idea of being able to add my own flavors and spices to the shake. While Yokebe does have a few different flavors available, there is always the concern of flavors being a bit metallic-tasting or too sweet or bitter. The ability to start from scratch and create my own flavor is intriguing. Almased is a bit more upfront about how the shake works and the science behind how it encourages weight loss. As a health professional with a science background, this appeals to me. Nutritionally, Almased packs a stronger punch with slightly less sugar and more protein. As a Registered Dietitian, I encourage the consumption of delicious, functional, real food over anything else. With any packaged product such as a shake mix, there is always the concern that unnecessary ingredients might be included, as well as confusion about what all the ingredients that sound like chemicals are doing in the shake. 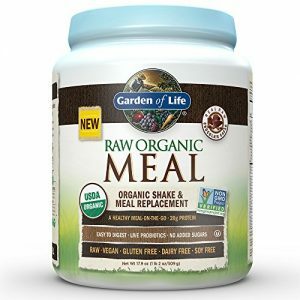 One nutritious alternative that I fully endorse is the Garden of Life Raw Organic Meal. It is one of the cleanest and healthiest shakes your going to find anywhere. However, as I realise that not everyone has the same dietary goals as I do. I’m very picky when it comes to picking meal replacements and they have to be plant based and low in sugar. In the end, each of us certainly can decide what our nutritional priorities are, and I encourage you to do your research and select the one that you like best.